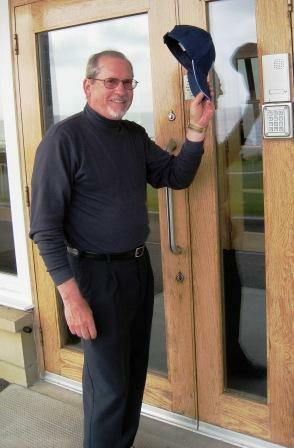 " Allan Ferguson is the Rick Steves of Scottish golf travel." Here's How to Book a Time on St. Andrews' Old Course - For 2019 bookings, click here for information. GOLF SCOTLANDTHREE WAYS TO BEAT THE COST OF HIGH-PRICED TOURS AND HAVE FUN DOING IT! Welcome to the Ferguson Golf website! If you are planning a golf trip to Scotland, this site can save your time and money in three ways. 1 As a travel consultant, I can work with you to create an affordable, gratifying golf trip. 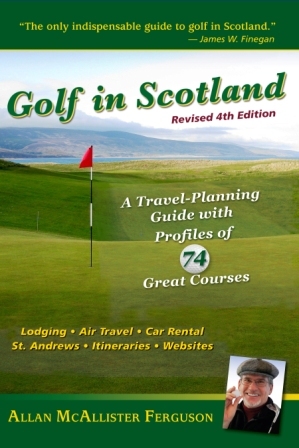 2 As an independent traveler, the best $25 you spend on your trip will be on my guidebook, GOLF IN SCOTLAND: A TRAVEL-PLANNING GUIDE WITH PROFILES OF 74 GREAT COURSES. Order from www.amazon.com. The book is also available in electronic format at both Amazon and Barnes and Noble. 3. As an information hound, you can use this website to connect with helpful planning websites. 1 To read about my consulting service, see "Consulting." 2 To learn more about my guidebook, see the Book Page. It's the "bible" of Scottish Golf Travel. Golf in Scotland: A Travel-Planning Guide . . . is designed to make you the expert and save hundreds, even thousands, of dollars on your trip to the Home of Golf! "I urge you to make this book your travel companion. It is comprehensive, thoughtful, and, in literal truth, invaluable. "the late James Finegan, author of Where Golf is Great, Blasted Heaths and Blessed Greens, and many more. 3 To explore helpful websites, see the Links page.